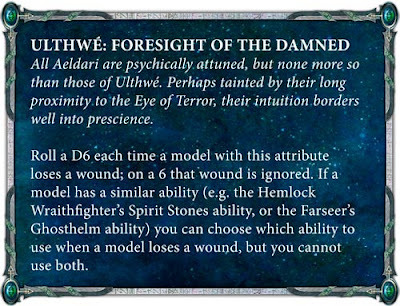 The Warhammer Community page has some early sighters of the Ulthwe rules. At first glance they seem very underwhelming but that needs to be couched with the fact that we haven't seen points values yet or the extent of psychic powers/stratagems/artifacts. The Ulthwe "Special Rule" is a watered-down Disgustingly Resilient. This works against Mortal Wounds as well but I'm not sure a 16% probability boost to a save is something worth leaving home for. The unique Ulthwe Stratagem is also not that wonderful at first glance. 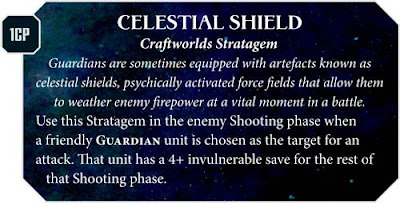 A +1 to all Hit rolls is nice but I think I would prefer a constant +1 to BS or WS as per previous iteration of Black Guardians. 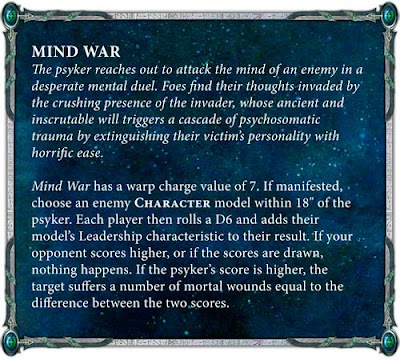 Given the CP cost to generating the +1 to Hit I think it is a bit underwhelming. 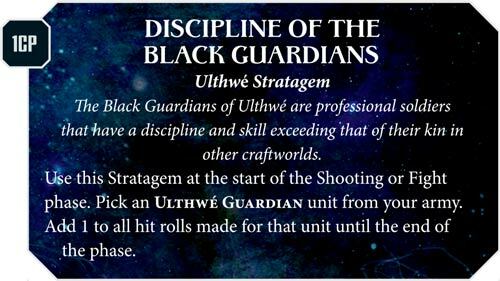 They also showed another Stratagem but this is not Ulthwe specific so while you might take more Guardians with Ulthwe it is available to all Craftworlds. It will start to burn through CPs fast too. Where there might be some utility is where you can marry it to Fortune. Again not Ulthwe specific, but it will work well with Eldrad. Still it carries a lot of uncertainty but think of the instance where you take those last four wounds away. So at first glance I am not jumping out of my skin. Yes, I can see the synergies but they come with a lot of caveats and not a small cost in CPs. A lot depends on unit costs. 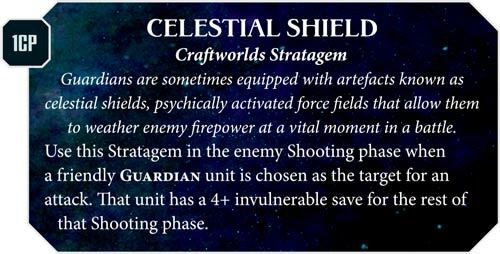 However I'm guessing we are more likely to see Eldrad having "away days' with other craftworlds. Time to dust of Eldrad's Alaitoc Clown Party! 40K - Combi Plasma - Single Shot or Whole Hog?